The expected in-stock date is 01 May 2019. Tune out the world so you can get into your music. 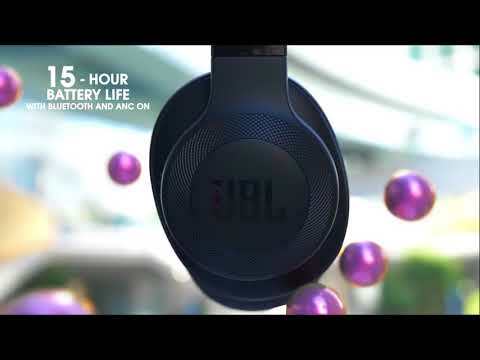 JBL E65BTNC is rated 4.0 out of 5 by 110. Rated 5 out of 5 by Jim G from Excellent headphones at a reasonable price I bought these noise cancelling headphones for my daughter and was impressed enough to buy a set for myself. I use them while mowing grass and running the blower. Sound quality is great and they are very comfortable. Rated 5 out of 5 by Gaet from Got my moneys worth Wireless headphones are a must for me. These are very satisfying to my needs and a great spend for me. Rated 5 out of 5 by JD2334 from Great headphones Was extremely satisfied with the sound of the headphones. Rated 5 out of 5 by Sion from Great over ear headphones with noise cancelling Excellent sound quality and noise cancelling. I bought these specifically for music and TV and they are of a very good quality. They fold up and come with a soft case for transport. Can the noise cancelling feature be used when not listening to music or on a call? Yes, this headphones has an Active Noise Cancellation (ANC) button that turns the feature on or off at your choosing. Yes they do. A 1 meter long cable is also included in the box. do these work well at the gym while running or playing basketball or do they slip off? I use them for running and have no problems with them staying on. I cannot speak for sports or cross training that requires a lot of fast stopping or directional changes as I haven&rsquo;t used them in those scenarios. Can people hear sounds if the music is all the way up even with the noise cancellation? Sorry first pair of noise cancellation headphones so don't really know how they work lol. Where can I find information on the cable? It broke shortly after buying it, and I need a replacement (now only one side works when its connected - but both sides on bluetooth). It's not listed on the specs page, don't know why. I'm getting a crackling on one side of the headphones but only when noise cancelling is on. Any thoughts on what's causing this and how I can fix it? Is there a case made for this model? No, there's none. Please check with third party manufacturers like Ebay or Amazon for a protective case.